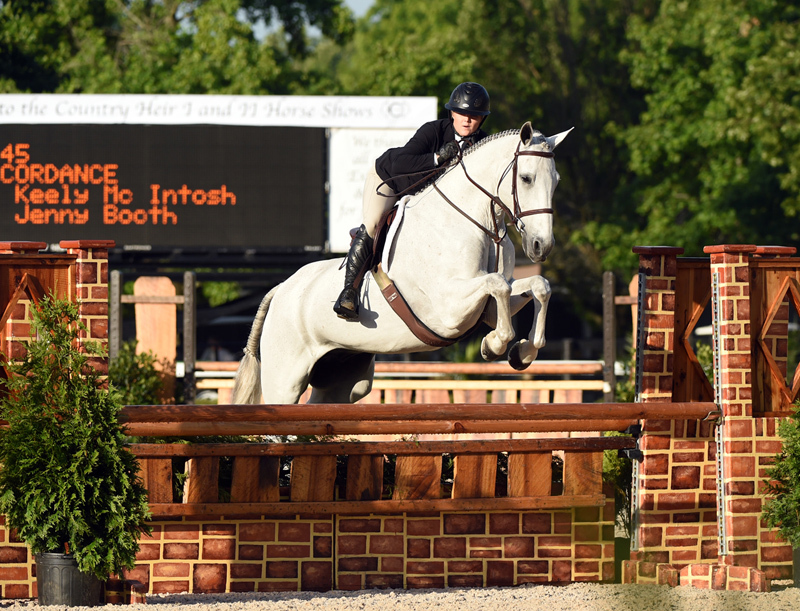 There aren’t many riders showing in USHJA International Hunter Derbies who don’t worry about counting strides in the lines. Hunter courses are often ticked off as, “outside six-stride, diagonal five, outside four.” Some riders take relief in the simplicity and ease of memorization with simple course designs. Most sear the stride counts into their memories as a lifeline. But Keely McIntosh, an amateur from Magnolia, Texas, must ride by feel rather than numbers. So when she canters in the ring for a hunter trip on her 16-year-old former grand prix horse Accordance, she takes each jump as it comes. In 2012, McIntosh experienced a traumatic brain injury after a freak accident in the warm-up ring at the Colorado Horse Park before a junior/amateur jumper classic. Her horse at the time, Eddy Money, tripped cantering away from a jump. McIntosh fell, had a seizure and ended up in the hospital with four bruises on her brain and a subarachnoid hemorrhage. Although fully recovered, she still lives with short-term memory loss, which can be an extra challenge in the ring. She compensates well and uses her natural feel to bridge the gap between her memory and the stride count. Photo courtesy of Keely McIntosh. “If you pull, you’ll probably add [a stride], and if you kick you leave one out. My horses luckily have great strides, so I land in the line and never really count. I just get down there on whatever stride I’m on,” said the 23-year-old. Aside from occasionally forgetting her jacket or to grab the numbers from the show office, there are minimal traces of the accident, which her doctors attribute to the fact that she was physically fit beforehand. Because fitness was a huge part of her life before the fall and also what helped her body survive, McIntosh now wants to make a career out of it. She helps riders around the show circuit exercise, incorporating the body building she learned after her recovery, and mixes the workouts with other exercise like running and weights. “A lot of people’s issues aren’t in the ring or that they can’t ride or are missing to jumps—it’s that they can’t pull the horse together. Being stronger takes away that issue. Being more fit takes away the mistakes you can make in the ring and gives you tools outside the ring to help you,” she said, adding that body building sounds scary, but isn’t as extreme as people make it seem. Keely McIntosh and Accordance in the hunter derby ring. Photo by Anne Gittins Photography. McIntosh is currently in the process of studying for her personal training license and plans to take the exam in a month. 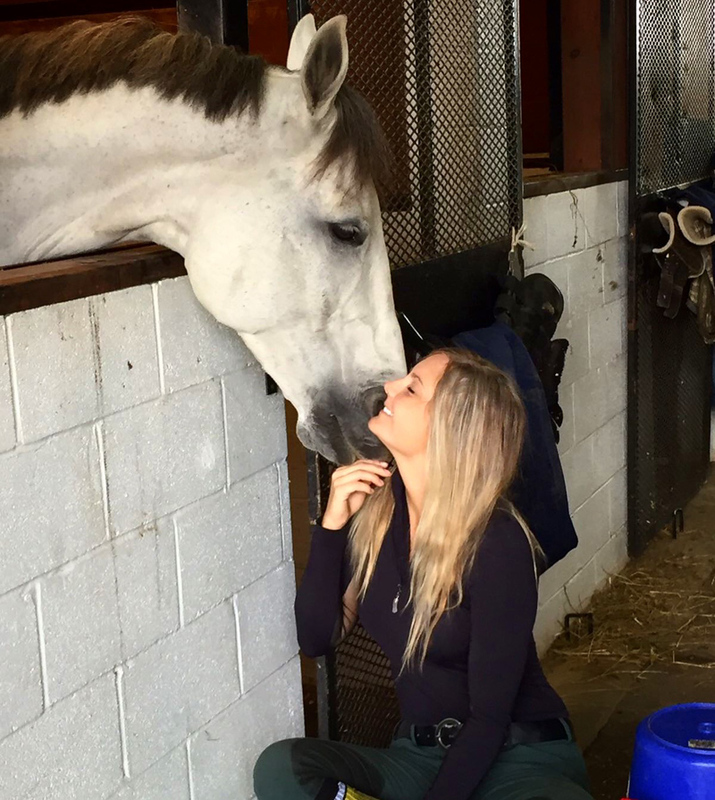 Before the switch towards a career focused on fitness, the young rider used her business degree in marketing from Texas A&M—she graduated in 2016—to help her mother, Jenny Booth, at Booth Show Jumpers doing ads and managing social media. She also worked remotely making websites for Evolution Labs, based out of New Jersey. McIntosh explained that most riders have specific areas they want to target or a certain goal. Keely McIntosh sharing a moment with Accordance. Photo courtesy of Keely McIntosh. “From that, we work backwards. If someone is more fit in general, we’ll do cardio and weights. If they’re weaker in weights, we’ll do less cardio and more weights, bands lifting or planking,” she said. When she’s not helping others with their riding, McIntosh is competing in the under-25 grand prix classes. 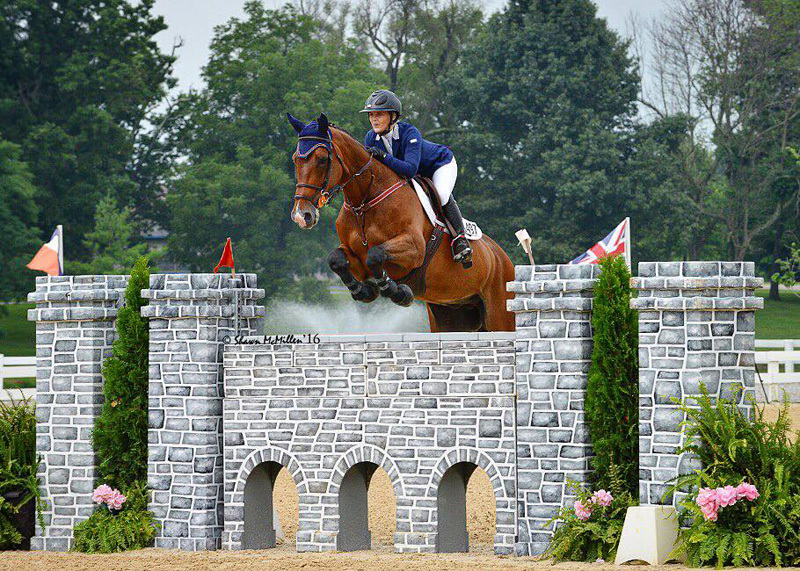 She’s currently competing two horses at the grand prix level—Goofy Van Overis, an 11-year-old Belgian Warmblood (Darco—Courage) gelding and So Live Helau, an 11-year-old Selle Français gelding (Dollar Du Murier—Ador De La Crasne, Chat D’Or). She’s also been showing her Belgian Warmblood mare Inne Van De Plataan (Zurich—Fame Van De Plataan) in the amateur-owner jumpers. McIntosh has the majority of her experience in the jumper ring, but this year qualified for the USHJA Hunter Derby Championships (Ky.) with her former grand prix horse, Accordance, a 16-year-old Holsteiner gelding (Acord II—Hera XXIIX, Bachus) also known as “Pepe.” She’s not headed to Kentucky for the Championships, though because she lent Accordance to a friend who’s horse had died this summer and lacked sufficient practice. McIntosh bought Pepe in 2013 as a grand prix prospect. “It was time to find a real grand prix horse. I remember sitting in Kentucky writing all the horses I loved down on a piece of paper as they walked in the grand prix ring. My mom laughed at me and said, ‘In your dreams—those aren’t in our budget. Maybe in another lifetime, Keely,’ ” said McIntosh. After selling one of her horses, the buyers recommended she try Pepe, one of Ortiz’s horses. Ortiz had shown him to the five-star level. “I tried him, jumped one or two jumps up to 1.55-meters and landed off the last jump. My mom cried too when Liza Richardson said Pepe could take me to the next level. The next day he was on the truck at our barn, and I got my dream horse that I wrote down on my little piece of paper,” she said. 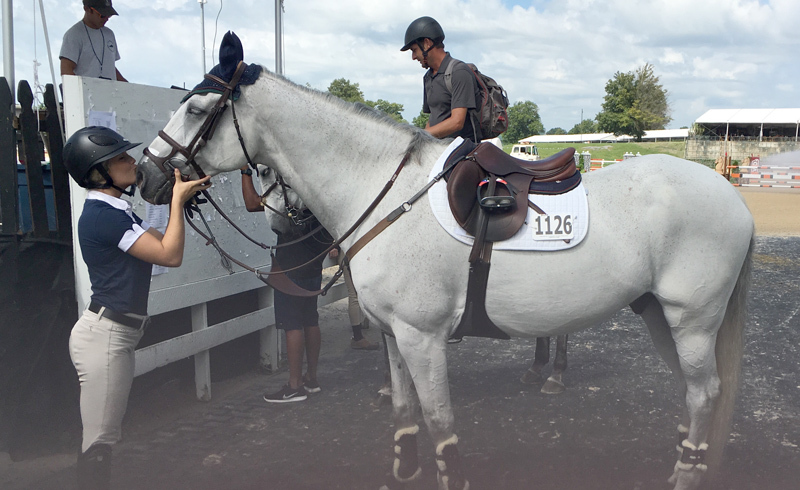 She showed the gray in the amateur-owner jumpers and the under-25 and national level grand prix classes for four years, earning ribbons at venues like the Split Rock Jumping Tour Bourbon International (Ky.) and Tryon Spring VII (N.C.). But as 2017 started, she braided him up and headed to the hunter ring, making their mark in the amateur-owner hunter division and the USHJA International Hunter Derbies. Before that she hadn’t shown in the hunter divisions for 11 years. When asked which discipline she prefers, she replied with her favorite elements of each. “I love them both. When you think you have a fantastic round in the hunters and you get a 75, it’s like ‘what did I do wrong?’ or when you mess up and get an 83 you’re like ‘ahh!’ In the jumpers when you make a mistake you know what you did wrong. I just love all of it—being able to do both is so good for your riding,” said McIntosh. Giving Pepe a kiss. Photo courtesy of Keely McIntosh. With a repurposed grand prix-turned-derby horse under her saddle, McIntosh is learning a lot by competing in a different arena. “Well, you can’t kick and pull in the hunter ring. I’ve definitely found that out. Being a hunter teaches you more finesse. In the jumpers, I end up going clean more often because I’m less in their face, and I’m not getting in their way that much. Being a jumper on other end helps in the hunters, because you think so quick. I can go in and kill every handy round. Hunters are teaching me in the jumper ring too—all the mistakes and bad habits I have show up [in those classes], so I fix them and the skills bleed over into the jumper ring,” said McIntosh. Although she loves the ring time, her favorite part of the sport is just being with the horses. “It’s not all about competing, but horses are like your dogs—they’re pretty much my life,” she said.